The preparation is well underway for the trip to Canberra for Cancon 2011. Some holidays have been approved from the office. I’ve organised somewhere to stay with friends whilst I am at Cancon and as he is another wargamer, I’ve ensured that it will be a hobby-packed three days. The armies are progressing – well, one of them is. The Carolingian/East/West Franks are being worked on for the DBMM competition. I still cannot decide on a list and have been bouncing between Carolingians and Frankish (both East and West). The Carolingians have an historic appeal but for a competition, perhaps are not the best with two ally generals. The West and East Frankish are a little later – they were what the Carolingians evolved into. They have the advantage of sub-generals rather than ally generals which provides a little more control for an army that is pretty much uncontrollable. 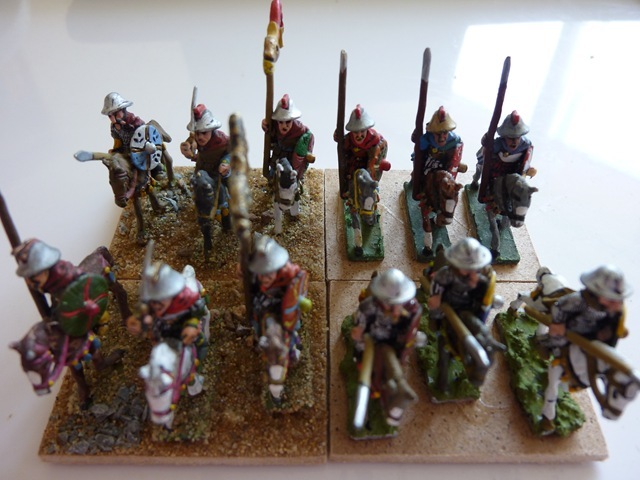 As I have not decided on the army yet, the rebasing is continuing with the core troops first – the troops that would be required for all three armies. Of 47 elements (bases) of figures, 2 are completed (they were in the test group), 26 are on the new bases and have had the sand added to that base before flocking with the remaining 21 on the new MDF bases and waiting sand. Tonight will see the sand on the remaining bases and perhaps the first paint on some bases. I have to decide the final army by Saturday – plenty of time to procrastinate with yet. I am also playing in the DBA competition on the 24th of January. I was thinking of painting a new army for that but with work pressures and the DBMM rebasing efforts, I expect not to be able to get a new army painted. I will therefore fall back on one of my painted DBMM armies and select a DBA army from them. I also need to get some terrain organised for the DBMM competition as well. I have the makings of those here and that will likely be a last minute thing. Another update in a week or so.